Proper storage of animal health products is essential to ensure their effectiveness. Medications not stored properly may become less effective, cause adverse reactions, and alter withdrawal times, leading to animal health concerns and/or chemical residues in meat or milk. 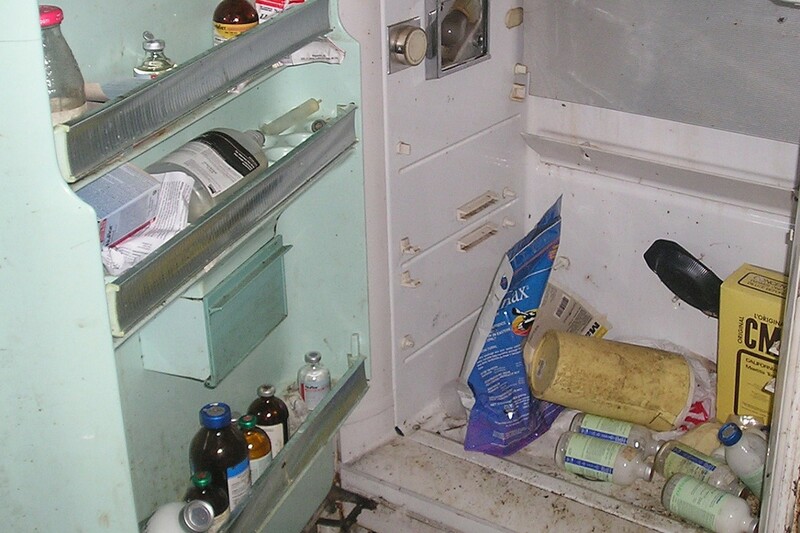 If your medication storage looks like this, you are putting the health of your herd at risk. Store products in a clean, dry, frost-free area. Protect products from temperature changes, humidity, sunlight, dust, moisture, animals, insects, and children. Do not store medications in an area where they could contaminate feed. Your primary source for information on storing medications properly should be your veterinarian. The next best source is the medication label. Label information: Medications should be stored in the packaging supplied with the product. Medication bottles and boxes are designed to protect the product and provide important information. Keep all packaging and instructions/inserts in case you need to refer to them. You should be aware of all information on the label and package insert such as the intended method of use, proper storage, handling instructions, and warnings. Never administer an unlabeled medication to an animal. If you are given medication that is not in its original packaging (such as a veterinarian dispensing a few pills from their stock), ensure the drug’s name, usage, withdrawal times, storage directions, and your veterinarian’s information is clearly written on the container. It is illegal for your veterinarian to give you unlabeled medication. Light sensitivity: Some products are damaged when exposed to light. These products will be stored in light-resistant containers (eg. brown glass), but you should also store them in a dark area. 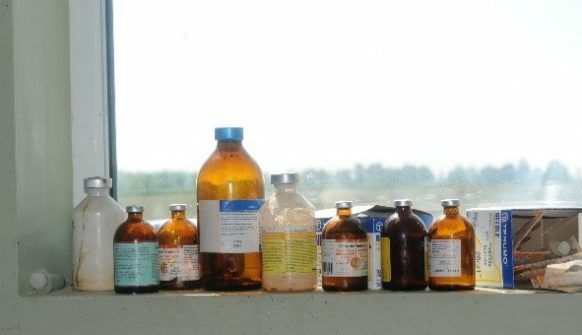 Medications in dark bottles should be protected from sunlight, not stored on a bright windowsill. It is likely these medications are also being exposed to temperature fluctuations by sitting in the sun. Refrigeration: One study found that 76% of refrigerators tested were unacceptable for storing animal health products due to inconsistent temperatures. Regularly monitor refrigeration temperatures. Refrigerators in temperature controlled environments and those who received regular maintenance and cleaning are most reliable for storing medications. Store livestock medication in a dedicated fridge or in a second, sealed container in a fridge to prevent contact with food or drinks intended for people. Expiry Dates: Check expiry dates on products before purchase and before each use. Only purchase drugs in amounts that can be used before the expiry date printed on the product. Use products with the closest expiry date first. Expiry dates and withdrawal times are only accurate if the product has been stored correctly. Disposal: Any expired products, those that were not stored properly (exposed to excess heat or cold), have become contaminated (e.g. 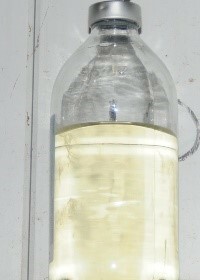 accidentally putting a dirty needle into the bottle), or appear discolored or cloudy should be properly disposed of. Your veterinarian may accept products for disposal. Work with your veterinarian to create a protocol on how to safely dispose of expired or contaminated products, empty bottles, and needles. If your veterinarian does not accept unwanted medications, your municipality might. The Clean Farms program also accepts unwanted medications and runs at least every three years. The next Ontario collection will be in 2019. Go to www.cleanfarms.ca for details. Note: if also disposing of sharps, these are typically only accepted by your veterinarian or a collection program if stored in a puncture-resistant container, such as a thick plastic bottle or sharps container. Ensure there is no way for the needles to spill by securely fastening the lid of the container. Using a dedicated sharps/biohazard container is the safest option. Multiple dose vials: Never store multiple dose vials with a needle in the rubber stopper. Always use new, sterile needles to fill syringes from the vial. Dispose of the product if the top is damaged due to repeated use. The label should indicate how long you can continue to use a product after opening it. If this is not on the label, ask your veterinarian what the “use by” date should be. Your veterinarian’s role: If you are unsure about proper medication storage, always check with your veterinarian. This is especially important for extra-label use of drugs (ELDU), which is very common in goat production. See Ontario Goat’s “Extra-label drug use in goat production” factsheet for more information. Your veterinarian can help you create protocols for storage and disposal of medications and needles and handling expired medications. If you are unsure if a medication is safe to use for any reason, contact your veterinarian before use.